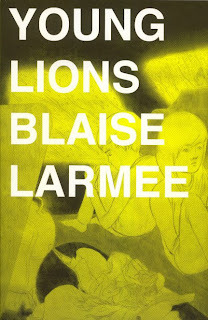 I just received a copy of Blaise Larmee's debut graphic novella, Young Lions. He'd emailed and asked to send a copy, noting that he gotten it published with the help of a Xeric grant. Well, I'm all for Xeric supported books so I was eager to take a look. As usual, though, I tried to shy away from finding out anything about the book before actually opening it. The art was, not surprisingly, the first thing to catch my attention. It's scanned directly from Larmee's pencils, and it looks as if he's made no attempt to hide or clean up the work. Eraser marks and smudges are common, technical errors are sometimes left in place, and occasionally you can see reversed images from another penciled page which had sat on top of the page you're looking at. In that sense, it's very deliberately raw. The story, if that's really the appropriate word, centers around four young adults who consider themselves conceptual artists. (We don't really see much of their art, so it's hard to say whether they are or just like to think they are.) They take a road trip down to Florida, and come back somewhere between depressed and disillusioned. If that doesn't sound like much of a story, that's because it isn't. By design. Young Lions is intended, I think, to be more emotional, intuitive and instinctual. It's not a work where you follow a protagonist's exploits as he carries on some character progression, and it's not a work in which you follow a series of events culminating in some grand climax. Young Lions is more akin to poetry. It's evocative and ephemeral, and begs to be studied carefully and digested slowly. At only 94 pages and an average words-per-page count that couldn't be higher than 15 or 20, it's tempting to try flying through it -- I'll admit that I made the mistake of whisking through a good chunk of it before realizing that's not how it needs to be read. But if you do that, you'll almost surely miss the point. Speaking to the art specifically, Young Lions can be deceptive. At first glance, the pages look like they might be just initial layout sketches. As noted above, there are smudges and corrections that make it look unfinished. But there's a nuance to the figures that say otherwise. Though they aren't detailed renderings, the figure forms are very elegant and the superficially simple outlines show an excellent understanding of the human figure. I was in fact quite taken by several pieces which show the chin sloping down into the neck. Coupled with some infrequently used 'camera' angles, they highlight a sublimity to the entire work. I don't know that I'd go so far as to say that Young Lions is uniquely experimental, but it's definitely pretty far removed from the norm and I don't know that I can make many direct comparisons to other work you might be familiar with. It'd be like trying to compare Robert Frost with Mickey Spillane or Anne McCaffrey. They're trying to achieve very different things, and the only real point of overlap is the basic language they're using. Don't misunderstand here: this is not a book of illustrated poems and the dialogue itself doesn't come across as verse. It's that Larmee does with pictures what Frost did with words. I think that's the key to appreciating Young Lions. If you go in expecting even a non-traditional story, you'll be disappointed. Or disillusioned. Or disinterested. But if you open it looking for visual poetry, and open yourself to comics beyond what you'd think about from reading Joseph Campbell, you'll find this quite enjoyable. Young Lions can be purchased directly from Larmee here for $10 USD.